The intrepid explorer has sailed the cosmic seas and collected treasures that far exceeded anything anticipated or even hoped for. It began its voyage at Earth with a fiery ascent atop a Delta rocket. After escaping from its home planet’s gravitational grasp, it flew through the solar system perched on a pillar of blue-green xenon ions that enabled the probe to accomplish a mission that would have been impossible with conventional propulsion. In 2009, with its sights set on more distant lands, Dawn swept past Mars, taking some of the planet’s orbital energy for its own. By its fourth anniversary, Dawn was conducting an extensive orbital investigation of protoplanet Vesta, the second most massive resident of the main asteroid belt. Dawn found it to be quite unlike typical asteroids. Rather than a big chunk of rock, Vesta is like a small planet, and scientists recognize it as being more closely related to the rocky planets of the inner solar system (including Earth) than to the much smaller asteroids. Vesta’s nearer brethren are the blue and white planet where Dawn began its mission nine years ago and the red one it flew by 17 months later. By its fifth anniversary of leaving Earth, the interplanetary spaceship was on its way to yet another distant, alien world. 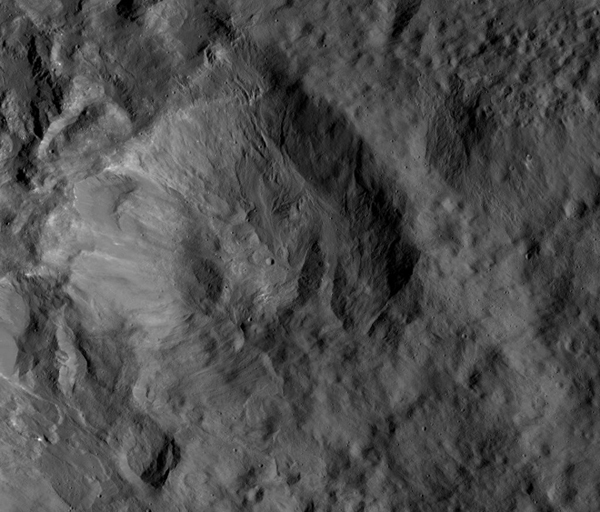 Under the careful guidance of its human colleagues, Dawn completed its 2.5-year journey from Vesta to Ceres last year. Now a perpetual companion of the first dwarf discovered, the veteran space traveler will spend all future anniversaries in orbit around Ceres, even after its operational lifetime has concluded. By February of this year, the spacecraft had exceeded all of its original objectives established by NASA. 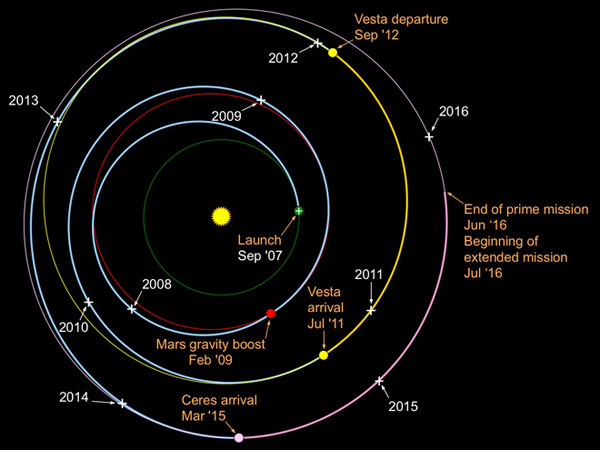 Doing so involved orbiting Vesta for 14 months and, at that time, Ceres for almost a year. On June 30, Dawn’s prime mission concluded, and on July 1, its "extended mission" began. One year ago today, the ship was in its third Ceres mapping orbit, scrutinizing the exotic landscapes 915 miles (1,470 kilometers) beneath it. Less than four weeks later, it started powering its way down through the uncharted depths of Ceres gravitational field to undertake the final planned observations of its long mission. When ion thrusting concluded on Dec. 13, 2015, Dawn was orbiting closer to Ceres than the International Space Station is to Earth. From its vantage point only 240 miles (385 kilometers) high, the probe used its suite of sophisticated sensors to develop a richly detailed portrait of the only dwarf planet in the inner solar system. 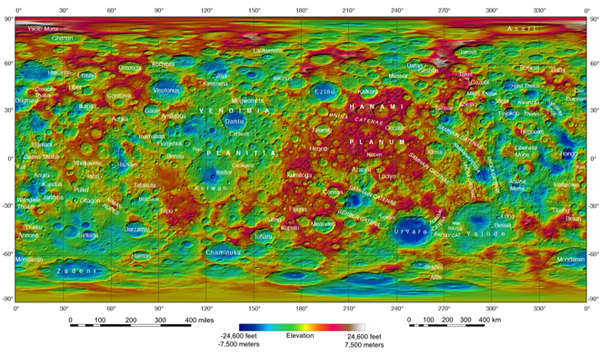 Dawn’s reason for venturing to its fourth mapping orbit was to collect about 35 days of neutron spectra, 35 days of gamma-ray spectra and 20 days of gravity measurements. Given the complexity of operating in the low, tight orbit, mission planners expected it could take about three months to acquire these precious data and transmit them to Earth. Operations turned out to be essentially flawless, and by the time Dawn left that orbit on Sept. 2, it had accumulated 183 days of neutron spectra, 183 days of gamma-ray spectra and 165 days of gravity measurements. In addition, the spacecraft amassed a sensational bonus of 38,000 high resolution photos (including stereo and color) as well as more than 11 million infrared spectra and 12 million spectra in visible wavelengths. The original plan was not to take any pictures or visible or infrared spectra at the lowest altitude. For such an overachiever, it’s fitting that now, on its ninth anniversary, the spacecraft is engaged in activities entirely unimagined on its eighth. With the critical loss of two of the four reaction wheels used to orient and stabilize the ship in space, the flight team (and your correspondent) considered it unlikely Dawn would survive long enough to celebrate a ninth anniversary. And everyone was confident that whether it was operating or not, it would still be in the fourth mapping orbit. There was a clear intent never to go anywhere else. But as we explained last month, with the extraordinary wealth of information Dawn gleaned, the team has been developing plans for new and previously unforeseen work at higher altitudes. Next month, we will detail the first set of new observations from an orbital perch of about 920 miles (1,480 kilometers). You can follow Dawn’s ascent to its new orbit by flying right behind it as it loops around Ceres or by checking the frequent mission status reports. 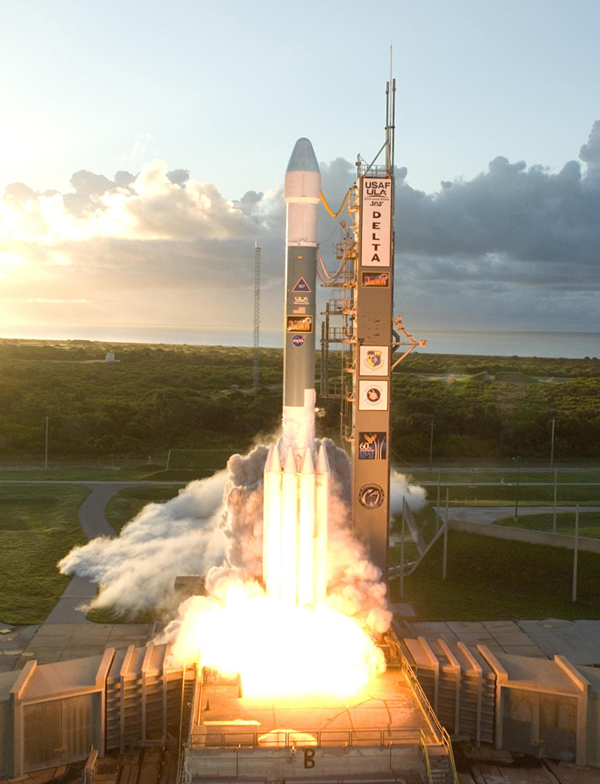 Nine years after launch, as Dawn maneuvers in orbit around a distant dwarf planet in order to conduct new observations, it is convenient to look back over its long trek through deep space. For those who would like to track the probe’s progress in the same terms used on past anniversaries, we present here the ninth annual summary, reusing text from previous years with updates where appropriate. Readers who wish to reflect upon Dawn’s ambitious journey may find it helpful to compare this material with the Dawn Journals from its first, second, third, fourth, fifth, sixth, seventh and eighth anniversaries. In its nine years of interplanetary travels, the spacecraft has thrust for a total of 2,044 days (5.6 years), or 62 percent of the time (and 0.000000041 percent of the time since the Big Bang). While for most spacecraft, firing a thruster to change course is a special event, it is Dawn’s wont. All this thrusting has cost the craft only 890 pounds (404 kilograms) of its supply of xenon propellant, which was 937 pounds (425 kilograms) on Sept. 27, 2007. The spacecraft has used 68 of the 71 gallons (256 of the 270 liters) of xenon it carried when it rode its rocket from Earth into space. The thrusting since then has achieved the equivalent of accelerating the probe by 24,800 mph (39,900 kilometers per hour). As previous logs have described (see here for one of the more extensive discussions), because of the principles of motion for orbital flight, whether around the sun or any other gravitating body, Dawn is not actually traveling this much faster than when it launched. But the effective change in speed remains a useful measure of the effect of any spacecraft’s propulsive work. Dawn has far exceeded the velocity change achieved by any other spacecraft under its own power. (For a comparison with probes that enter orbit around Mars, refer to this earlier log.) It is remarkable that Dawn’s ion propulsion system has provided 97 percent of the change in speed that the entire Delta rocket provided. Orbits are ellipses (like flattened circles, or ovals in which the ends are of equal size). So as members of the solar system family (including Earth, Vesta, Ceres and Dawn) follow their paths around the sun, they sometimes move closer and sometimes move farther from it. For readers who are not overwhelmed by the number of numbers, investing the effort to study the table may help to demonstrate how Dawn patiently transformed its orbit during the course of its mission. Note that five years ago, the spacecraft’s path around the sun was exactly the same as Vesta’s. Achieving that perfect match was, of course, the objective of the long flight that started in the same solar orbit as Earth, and that is how Dawn managed to slip into orbit around Vesta. While simply flying by it would have been far easier, matching orbits with Vesta required the exceptional capability of the ion propulsion system. Without that technology, NASA’s Discovery Program would not have been able to afford a mission to explore the massive protoplanet in such detail. But now, Dawn has gone even beyond that. Having discovered so many of Vesta’s secrets, the stalwart adventurer left it behind in 2012. No other spacecraft has ever escaped from orbit around one distant solar system object to travel to and orbit still another extraterrestrial destination. 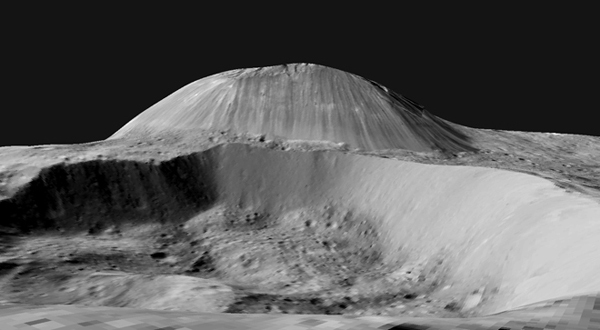 Dawn devoted another 2.5 years to reshaping and tilting its orbit even more so that now it is identical to Ceres’. Once again, that was essential to the intricate celestial choreography in March 2015, when the behemoth tenderly took hold of the spacecraft. They have been performing an elegant pas de deux ever since. Its ion propulsion system has allowed Dawn to do even more than orbit two distant and fascinating bodies. At each one, the spacecraft has changed its orbits extensively, optimizing its views to conduct detailed studies, something it would not have been able to do with conventional propulsion. Dawn passed a coincidental pair of milestones in its orbital mission at Ceres last week. The dwarf planet reached out to take Earth’s emissary into a gentle but permanent gravitational embrace on March 6, 2015. Sept. 23, 2016, was 1,500 Cerean days later. (Ceres turns on its axis in 9 hours, 4 minutes, considerably faster than Earth, although not all that different from the giant planet Jupiter, which takes 9 hours, 56 minutes). Interestingly, on Sept. 22, Dawn completed its 1,500th orbital revolution around Ceres. Given the equality between the number of orbits and the number of Cerean days, you may be tempted to conclude that Dawn orbits at the same rate that Ceres rotates. Please resist this temptation! Dawn’s early orbits took weeks to complete, and as the spacecraft maneuvered to lower altitudes, eventually they took days and then hours. 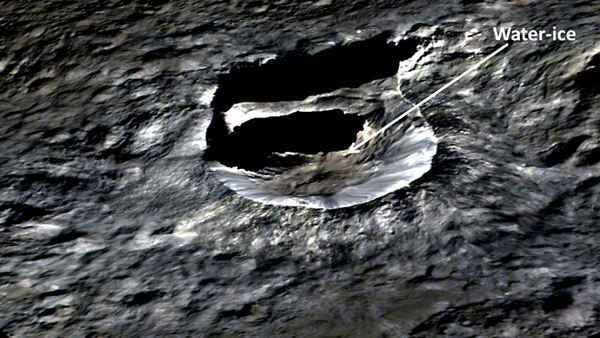 In its lowest altitude, the spacecraft circled Ceres in only 5.4 hours. (For a reminder of the details of the orbits, see this table and this diagram depicting preliminary orbit sizes.) So, it truly is a coincidence that the average has worked out so that Dawn has revolved as many times as Ceres has rotated. And now that Dawn is raising its altitude and thus increasing the time required to complete an orbit, such a coincidence will not occur again. Ceres is very stubborn and will keep rotating at the same rate. Dawn, much nimbler and more flexible, is currently in a 13-hour orbit. By the time it completes ion thrusting next week, the orbit period will be almost 19 hours. Now in the 10th year of its deep-space expedition, Dawn is not satisfied simply to rest on its laurels. The explorer (along with its support team on distant Earth) is committed to remaining as prolific and profitable at Ceres as it was during earlier years of its extraordinary and innovative mission of discovery. The largest body between Mars and Jupiter is a relict from the dawn of the solar system, a strange and fascinating world of rock, ice and salt that likely has been geologically active for more than 4.5 billion years. Ceres was first glimpsed from Earth more than 200 years ago but held her secrets close until Earth finally answered her cosmic invitation. Now, after so very long, Ceres is whispering those wondrous secrets to her permanent companion. Dawn is listening carefully! Dawn is 660 miles (1,060 kilometers) from Ceres. It is also 1.99 AU (185 million miles, or 297 million kilometers) from Earth, or 760 times as far as the moon and 1.98 times as far as the sun today. Radio signals, traveling at the universal limit of the speed of light, take 33 minutes to make the round trip.